Perhaps one of the most popular music and dance styles ever to emerge from Brazil, samba evolved in Rio de Janeiro by the early 20th century and grew to become the quintessential music and dance form associated with Rio's carnaval. With its rich and syncopated rhythm and its often voluptuous dance moves, samba has circled the globe as one of the most infectious and popular styles from the South American continent. The word "samba" is thought to be derived from the Kimbundu (Angolan) term semba, which referred to an "invitation to dance" as well as a common appellation for the dance parties held by slaves and former slaves in the rural areas of Rio. These dances involved gyrating hip movements (called umbigada) and had roots going back to the colonial period in the Congolese and Angolan circle dances. Over time samba gained important influences not only from Brazilian predecessors such as the maxixe and the marcha, but the Cuban habanera and German polka as well. As a song form, samba was extremely popular during the turn of the century, with some of the early recordings dating back to 1911. Among the early pioneers of the song form was Alfredo da Rocha Vianna Jr., known as Pixinguinha, who helped to crystallize the form as well as develop a richer harmony. From the 1920s and into the height of the radio era of the '30s, sambas were slower and more romantic (such as those of Ismael Silva), leading to the subgenre known as samba-canção, which emphasized the melody over the rhythm, and lyrics that were more sentimental and often moody. Brazilian crooners and composers put samba on the international radar, and icons such as Carmen Miranda embraced the form, becoming a star in Brazil long before her move to the U.S. and Hollywood as a personification of Brazil's exuberant side. By the 1950s, as samba-canção began to lose its momentum, a more percussive and funkier style of samba began to develop in the poor areas and shantytowns (known as favelas). At first called samba de morro because of its development in the morros (hills), the style came to be known as samba-de-batucada, and emphasized the polyrhythmic sounds of multiple percussion instruments. This powerful sounding form would in time become the heartbeat of Rio's carnaval, and the primary vehicles for the style were (and are) organized groups or contingents called escolas de samba (samba schools). Dating back to the late 1920s, Rio's escolas emerged as fraternal groups devoted to playing and dancing for carnaval, and now represent some of the most important cultural institutions in the country. Brimming with hundreds of percussionists (collectively called the bateria), dancers, costume and float designers and choreographers, the escolas prepare virtually year-round for the annual carnival parade, and each group enters into competition with its theme samba called the enredo. 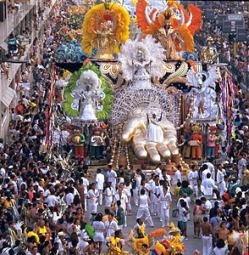 Rio is not the only city in Brazil to offer Carnaval festivities; the former colonial capital of Salvador, Bahia is also home to one of the most exciting and perhaps more roots-oriented carnival traditions, in particular as the state of Bahia has retained much of its African heritage as the country's center for the Afro-Brazilian religion of candomblé. Another important development in the legacy of samba took place in the late 1950s which would spark the second international wave of popularity for Brazilian music: the development of bossa nova. Considered an adaptation of the previous samba- canção form, bossa nova emphasized the melodic and vocal aspects of samba in a slower, more romantic style fused with the richness of American jazz harmony. The result was a sound many music critics first panned for its "out-of-tune" qualities, but its popularity soared as pioneers such as Antonio Carlos Jobim and João Gilberto brought bossa nova to new heights. Films such as Black Orpheus (with a musical score of sambas and bossa novas composed by Jobim) wowed international audiences with the sounds of authentic Brazilian music. By the 1970s, samba saw its rise within the era of MPB (música popular Brasileira) as artists such as Milton Nascimento, Djavan and Ivan Lins modernized the more dynamic batucada style with contemporary harmony and instrumentation, fusing samba with rock, jazz and other forms, and bringing the style into the mainstream. 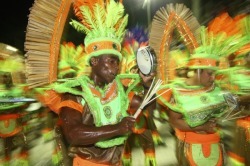 No longer would the sound of samba be limited to its role as the soundtrack for carnaval. 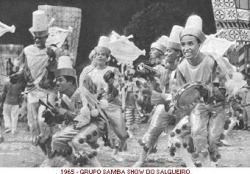 Other subvarieties of samba began to emerge, including partido alto (a funk-inspired style) and pagode (a smaller group format associated with parties and informal gatherings). Samba was everywhere, and it seemed to be the measure of happiness for Brazilians of all races and social classes. While much of samba's history is centered in Rio de Janeiro, a new development of the genre began to emerge in the eastern state of Bahia in the 1980s, as artists in Salvador created a new percussive style that was a bit slower and more driving, with lyrics that reflected the ideology of Brazil's African Diaspora. The group Olodum pioneered by the bloco Afro style, which adapted some of the batucada elements of Rio's samba and focused on a more hypnotic, drum-infused sound. Olodum's lyrics spoke of black culture and pride, and gave Bahian youth an outlet for their frustrations through the formation of a strong community organization dedicated to providing education and opportunity. With much of Brazil's black youth on the fringe of society, blocos such as Olodum provided much needed cultural and political refuge, and also happened to produce one of Brazil's most exciting new samba offshoots. In time, the bloco-Afro sound would fuse with Jamaican reggae and be known as samba-reggae, resulting in one of the most popular incarnations of samba into the 21st century.